Waters Begin to Recede In Minot; Wait Could Be Weeks : The Two-Way In Minot, N.D., floodwaters are finally starting to recede into the Souris River, according to a National Guard spokesman who talked to the AP. But in the town, 4,000 homes have been damaged by the river, and thousands of residents remain homeless. Air Force SSgt. 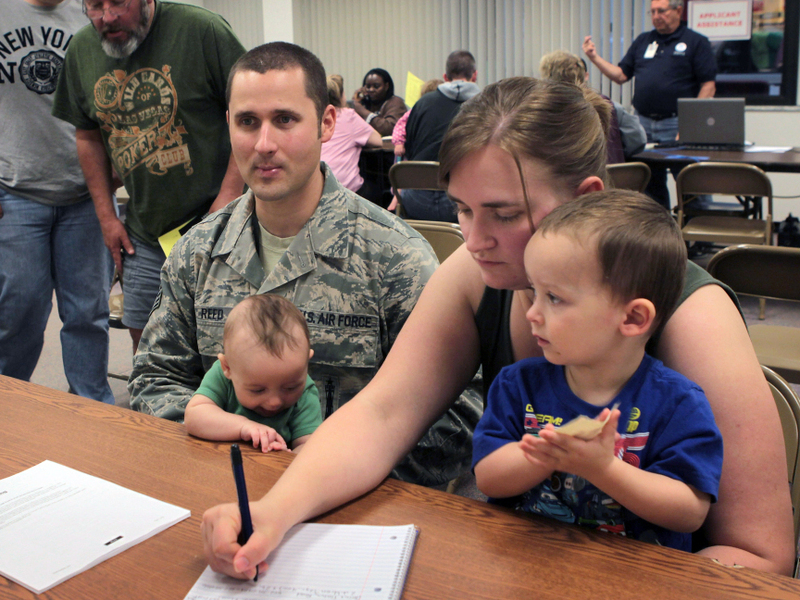 Chris Reed, holding his son Colby, and his wife, Tracy, with son Wesley, seek help at the FEMA office. The couple is looking for housing after their home flooded. In Minot, N.D., floodwaters are finally starting to recede into the Souris River, according to a National Guard spokesman who talked to the AP. But in the town, 4,000 homes have been damaged by the river, and thousands of residents remain homeless. Flooding reached a peak over the weekend in Minot, and the water level had fallen by a reported 6 inches by Monday afternoon. But that means other communities downriver — such as Velva and Sawyer — are now under threat of flooding. In a report for All Things Considered, NPR's Carrie Kahn reported on efforts to keep those two town safe. North Dakota Gov. Jack Dahlrymple says damages to his state will probably top $300 million. He says he needs the federal government to agree to that figure, so more assistance can be provided to flood victims. "The challenge is going to be to get that declared as soon as possible," he said. North Dakota has been enjoying an economic boom due to the oil exploration in the western part of the state. Unemployment is just above 3 percent. The state is considering dipping into a rainy day fund flush with oil revenues to help out those hurt by the flood. When the Souris River — or the Mouse River, as it's often called — crested early Sunday, it broke a record set in 1881. Minot's levees evidently withstood the flooding, which was four feet higher than the previous record. Faced with days and likely weeks before the water falls enough to allow rebuilding to begin in full, the state has opened recovery and aid centers for displaced residents.